How was your weekend? 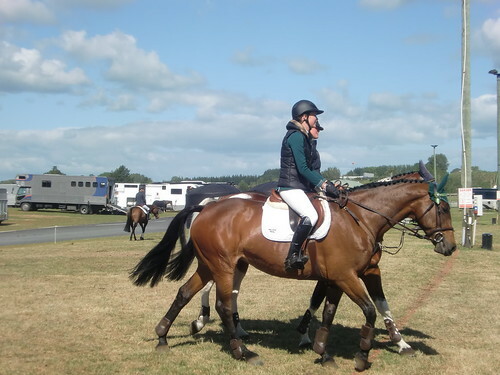 You went out of town visit nice New Zealand nature or… went off your farm to help at a horse jumping show? 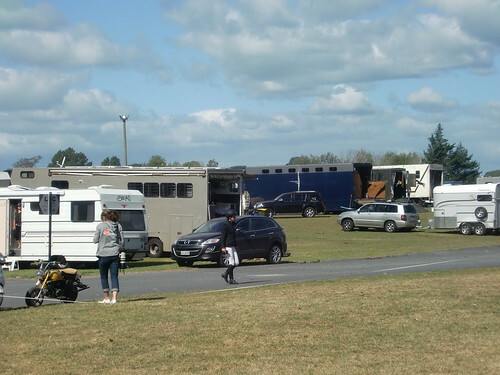 A part of the INTERNeX team went this weekend to a horse jumping show to watch a few Farmstay interns who had to work on the horse jumping show. That was fun! 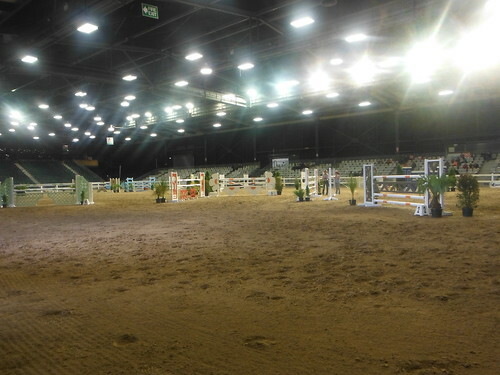 We went for a day to the jump show near Cambridge to visit the Farmstay interns and it was great to see what the program also contains. It’s not that you only have to work on the farm. These shows are awesome to work on and you have to take care of the horses. You like horses, farmlife and work outside? Check out our Farmstay program and see what it has to offer for you! 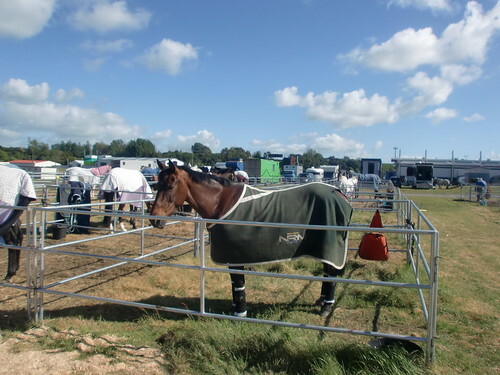 This entry was posted in How was your weekend and tagged farmstay, horse show, INTERNeX on November 5, 2013 by INTERNeX New Zealand. Fantastic, amazing, great, cool, gorgeous, EAST BRO! East bro definitely belongs in this list of words, why? Because it is something magical. East bro is another trip you can make on the North Island if you are in New Zealand. Stray is the only bus company who offers this trip, what makes it extra special. Not a lot of people have went to the east coast even not the Kiwi people, what makes it even more special. A big part of people who lives on the east coast is Maori. So if you are looking for the real cultural New Zealand sport, GO THERE! A good thing to know they only offer this trip in the summer, it starts on 3th of November and the last trip leaves on the 30th of April. They leave on Wednesday and Sundays from Rotorua. Luus and Lies went from the 25th of October till the 28th of October. They recommended you to stay at least four days, but you can always stay longer off course. What I already mentioned it is a great place to go if you are looking for the Maori culture. All they owners of the hostels were we stayed were Maori people, so you can expected really friendly people and amazing food! The first stop we make was just outside Gisborne on a place just next to the beach. We had a great dinner there with some fresh crayfish and mussels. After the dinner we drunk some beers, make a fire, listen to some guitar music, in other words we were having a great time! The plan was to go not that late to bed, because of the sunrise the next morning but because the atmosphere was so good we just had a short night. Especially when we wanted to go to bed an one of the guys offer us a sheep tail and yeah you don’t say no to that. It was a, extraordinary experience to eat a sheep tail. The next morning was a little bit harder after a few hours sleep, but the beautiful sunrise makes us forgot our tiredness. What makes the sunrise in Gisborne so special, well it is the first sunrise in the world. While the sun was burning on our skin, we were going to feed the stingrays, what is a funny thing to do. The biggest one was 2.5m span, so imagine that is bigger than a person. The stingray were really sweet and they were eating the fish from your hand, what feels quite funny. After feeding the stingray, we went to the most natural rockslide I have ever seen. It is a 60meter rockslide in the middle of the river. So we brought some wetsuits and tubes and there we go off the 60meter rockslide, a lots of fun! On our way to the next hostel we made a stop at the pier, who was the longest pier in New Zealand. And off course you can’t leave before you jumped of the pier. In the evening we arrived at our new hostel, an old monastic. The food was really good there as well, chicken, sweet potatoes, etc and a delicious desert. The next morning we had to wake up early for a creative workshop. You could choose from flagging, bone carving or greenstone carving. We both choose the flagging, but it was a hard decision because all the workshops seems to be fun. You can see on the pictures the results. After the workshop it was time for something active and we climb up the hill to see the lighthouse and the great view around it. Time flies when you are having fun, so after the lighthouse we already need to go to the next hostel. One off the most beautiful places I’ve ever been. A fantastic house next to the beach. Were you can do a lot of fun activities, like shark diving, surfing, canoeing, swimming, snorkelling, boat cruises etc. that sounds good fun huh?! And the best part is they have a lot of cheap activities. You only pay $30 for a boat cruise including meal and $10 for rent a surfboard and a lot more good deals. For all the hostels you only pay $25 and believe me they are totally worth the money. So are you interested in this trip, come to the Internex office and we will book it for you with a discount off 5%! Or come to our office and we help you further! This entry was posted in How was your weekend, INTERNeX, new zealand and tagged East bro, east coast, INTERNeX, new zaland, stray on October 29, 2013 by INTERNeX New Zealand. Wow, wow, wow, what an awesome trip was that. Last week Luus and I went on a trip to the North Island with the STRAY bus. For so far we only had seen Auckland, what we really enjoyed, but it was really fun to see the real stuff of New Zealand, the Nature! It was an week full of amazing activities, STRAY did a really good job! We went on a trip from the 18th till the 22th of September. It was an trip around the north island of New Zealand. We will tell you about every stop we made, to get a good view from what we did and what you also can do! Wednesday we left from the office off stray early in the morning, so we still had the hole day. We first drove to a supermarket, so don’t worry if you’re not prepared (as we did). After the supermarket we made a quick stop at an beautiful waterfall from eleven meters high. Then we drove to the highlight from that day namely Raglan, the surf paradise from New Zealand. It was an beautiful day for surfing, so we were really lucky. It also is an really quiet beach, what’s good. But maybe that was, because it was winter season. You can get a lesson from two hours from some really kind surf teachers. You start with practice on the ground and after a few minutes they bring you to the beach, where you can practice your surfing skills. If you don’t like to surf, there is also an possibility to hike in to the mountains (the sleeping lady). In the evening we did an harbour cruise to see the sunset. 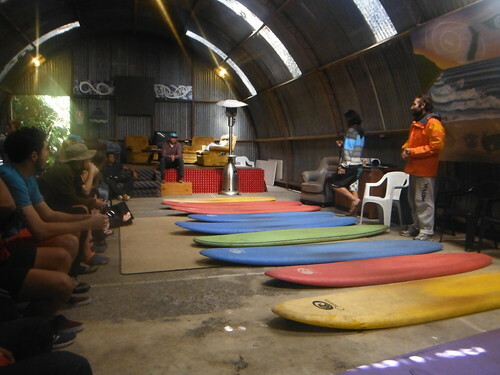 You sleep in an amazing hostel when you go to Raglan. The hostel is in the bush bush, but still with an view over the sea. The second day we went to waitomo caves, were we did some caving. That is absolutely amazing. It doesn’t matter if you’re a girl or boy, you definitely think this is extreme. You go via a really small entrance into the caves and then you follow some small course. You go abseiling for 80 meters under the ground, also along some waterfalls. A cool part in the caves is that you can see a lot of glowwurms. After the caves, we went to a maori family to experience their culture. First you do the ceremony with the maori traditions including the hongi (nose kiss). After the ceremony, you got some really good food, made by the family and then you’re going to watch to some maori dances. Of course you also going to try them by yourself, what is fun! Post a good night you will sleep together in a beautiful maori house. The next day we went to a national park called National park. Because of the wetter we were not allowed to do the hiking. But if you go there, try to do one of the beautiful walks. Instead of hiking we went to the hidden pool from Gollem, of the Lord of the Rings movie. The hostel were we stayed that night is absolutely relaxed. You have a good room for three people, so you just share your bathroom with two other people. Besides that, you have two hot tubs, were you can relax the hole evening. Or you can go to the bar just 100 meters further. That is what we did, a cool place to grip a beer. After a good sleep in the hostel, we went to a place that called the blue duck station. Is was in the middle of nowhere, what makes it very special. In the midday we went haunting. You go with an jeep into the bush and see the beautiful nature and if you want you can go shoot some goats or rabbits. In the evening we make an fire and enjoyed some beers and have some good talks and good sings. So conclusion, the STRAY trip was absolutely amazing!!! If you also want to go with stray just ask Chris or Luus or Lies for more information or experiences and you can book it via INTERNeX (if you’re from INTERNeX) with some discount. This entry was posted in How was your weekend, INTERNeX, new zealand and tagged INTERNeX, new zealand, North Island, stray on September 24, 2013 by INTERNeX New Zealand. 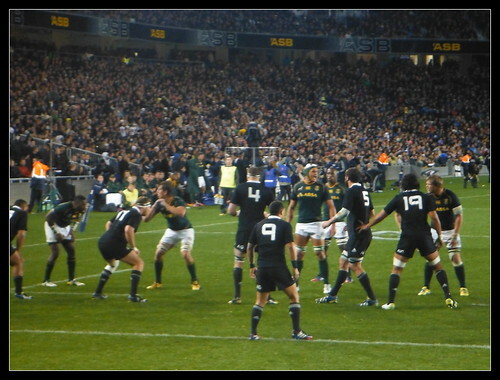 INTERNeX New Zealand: All Blacks! What a fantastic atmosphere in Eden Park. 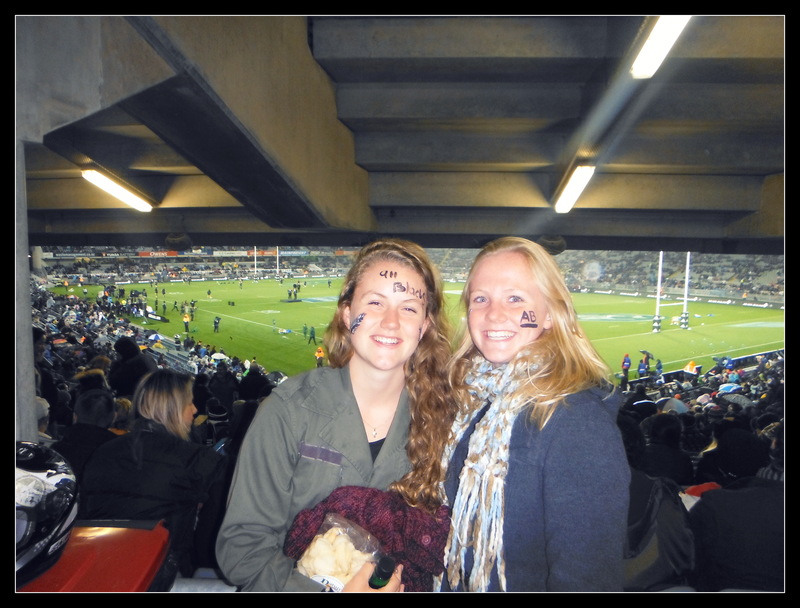 Of course we did face painting and went support the All Blacks. Do you know their typical Maori warriors dance? It was pretty awesome to see that in real life. We did not what to expect from a real game, but was going hard-to-hard, bloody stand. But hé, they won the game against South Africa! Check: http://www.allblacks.com/ for more All Blacks! 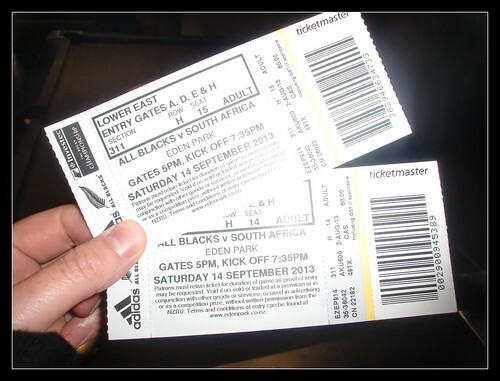 This entry was posted in How was your weekend and tagged all blacks, eden park, game, INTERNeX, saturdaynight on September 17, 2013 by INTERNeX New Zealand. It has been quite a long time I did not post on the blog, but I won’t wait one more month for the next one I promise. I hope you all are enjoying the end of the summer, even if the weather in that summer itself was not really great, that’s the least we can say. As some of you may know I’m passionate about rugby and I’m now playing for the Eden R.F.C Club, near Eden Park, and this weekend was the last “friendly game” before competition kicks off next weekend. So we headed to Takapuna to take on our neighbours from the North Shore and unfortunately… we lost. You may have heard that the Super Rugby season is on, tickets are cheap, entertainment guaranteed : I really encourage you to go watch a game at Eden Park, and don’t be afraid to go alone, the supporters group, the Blue Army is always welcoming everyone in the Lower East Stand of the stadium. 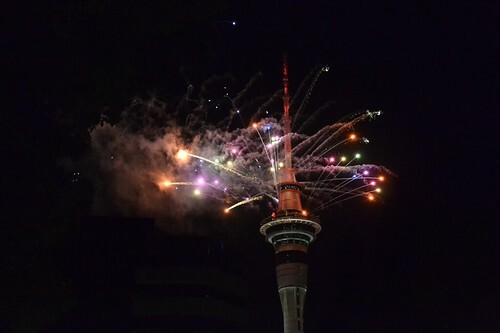 This entry was posted in How was your weekend, INTERNeX, new zealand and tagged auckland, eden, eden park, festival, food, international culture, picture of the week, rugby, weekend on April 2, 2012 by ixrobin. INTERNeX New Zealand : How was your weekend ? Hi everyone, I hope you had a great weekend. Mine was not particularly busy but on Sunday I went to Orakei Domain where I met the Auckland Blues team as they were playing with kids for a little session to meet the fans. I could get some good pictures with All Blacks and had some stuff signed by them. Chris went to Splore 2012 where apparently he had a great time, camping and going to the concerts. I hope your weekend was busy but in a good way ! 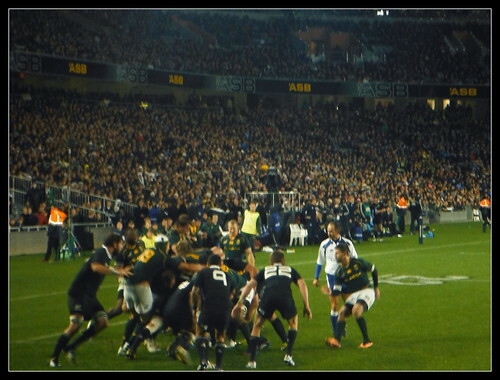 This entry was posted in How was your weekend, INTERNeX and tagged all blacks, auckland blues, blues, camping, concert, fans, festival, music, rugby, splore, super 15, weekend on February 21, 2012 by ixrobin.